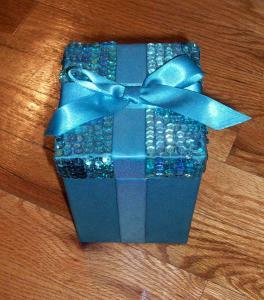 Turquoise satin & sequin gift box or just great for show or to keep "stuff" in. Colour is the deeper turquoise. Measyres 6 1/8" high x 3 7/8" wide. Feel free to e mail us with any questions, extra photos and all offers are considered. Will combine on multiples for $1.00 extra on each and 100% full refund if not fully satisfied.